Members treated under the care of providers in value-based reimbursement models with Humana experienced greater quality than those treated by providers in standard Medicare Advantage settings. Members served by providers in value-based reimbursement models had more screenings and healthier outcomes than their counterparts served in standard Medicare Advantage settings. "These results are evident of the strong, trusting agreements we have built with our provider partners and have also led to cost reductions." LOUISVILLE, Ky.--(BUSINESS WIRE)--The continued impact of the value-based reimbursement model once again shows better quality and healthier outcomes, with lower costs, for people with Medicare Advantage. 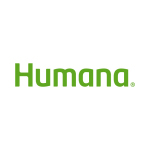 Humana Inc. (NYSE: HUM), the country’s second largest Medicare Advantage health plan provider, released its 2014 population health results today. For the 2014 results, Humana compared quality and outcomes for approximately 1 million Medicare Advantage members who were treated by providers in value-based reimbursement model agreements with Humana versus members who were treated by providers in standard Medicare Advantage settings. Humana also experienced 18 percent lower costs in total for this same member population treated by providers in value-based reimbursement models setting versus original fee-for-service Medicare. A strong supporter of the value-based reimbursement model, Humana has helped Medicare Advantage members across the industry experience better quality and healthier outcomes through partnerships with approximately 44,000 providers in value-based reimbursement models as of September 30, 2015. The positive impact of the value-based model in Medicare Advantage also reflects Humana’s support of the goal of the Department of Health and Human Services of tying 50 percent of traditional, or fee-for-service, Medicare payments to quality or value by 2018. Currently, approximately 59 percent of Humana’s individual Medicare Advantage members have access to primary care physicians who are participating in value-based relationships. Humana’s goal is to continue growing its programs so that 75 percent of individual Medicare Advantage members are attributed to primary care physicians who are participating in value-based relationships by the end of 2017. Transitioning providers to value-based relationships is also a key part of Humana's 2020 goal, which is to improve the health of the communities we serve 20 percent by 2020 by making it easy for people to achieve their best health. Providers Deliver Better Quality: Humana providers in value-based reimbursement relationships had 21 percent higher Healthcare Effectiveness Data and Information Set (HEDIS) Center for Medicare and Medicaid Services (CMS) Star scores as compared to providers in standard Medicare Advantage settings. Members Experienced Healthier Outcomes: Humana Medicare Advantage members in value-based reimbursement model relationships experienced 7 percent fewer inpatient admissions per thousand. In addition, screening rates were higher for the following: colorectal cancer screening (+7 percent) and breast cancer screening (+6 percent). Humana had Lower Costs: By focusing on quality and health, Humana experienced 18 percent lower costs in total in 2014 for members who were treated by providers in a value-based reimbursement model setting versus original fee-for-service Medicare. When Medicare Advantage plans generate savings, costs are lowered for the government, as well as for plan members through reduced out-of-pocket costs, lower member premiums, and/or additional benefits. Humana’s Accountable Care Continuum is guided by the company’s integrated and coordinated health approach; a defined, measurable patient population and pay-for results based on improved clinical outcomes and reduced costs. 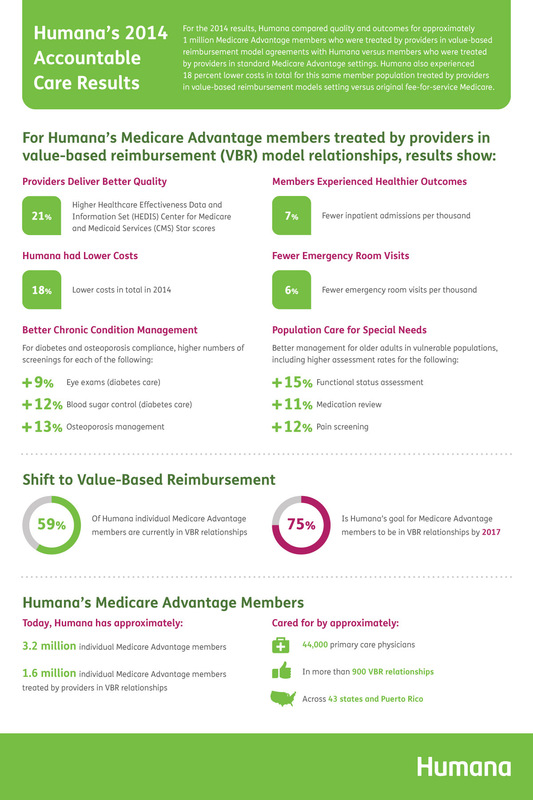 Humana’s assessment of the impact of its value-based approach supports the shift from a fee-for-service model to an accountable care model, aka value-based reimbursement model, of health care showing results in improved quality, health outcomes and cost savings. Better Chronic Condition Management – For diabetes and osteoporosis compliance, the numbers of screenings for members in value-based reimbursement models were higher for each of the following: diabetes care – eye exam (+9 percent); diabetes care – blood sugar control (+12 percent); and osteoporosis management (+13 percent). Fewer Emergency Room Visits – 6 percent fewer emergency room visits per thousand than those in standard Medicare Advantage settings. Population Care for Special Needs – Better management for older adults in vulnerable populations. Higher assessment rates for each of the following: functional status assessment (+15 percent); medication review (+11 percent); and pain screening (+12 percent). 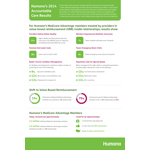 Last year, Humana announced results for its 2013 Medicare Advantage membership. The 2014 results are not considered a direct comparison due to multiple demographic changes in member population. Humana’s total Medicare Advantage membership is 3.2 million individuals, which includes members being treated by providers in value-based and standard Medicare Advantage settings.